Gurugram University organized an interactive session on Road safety for the Students by Dr. Rajshri Singh, IG, Crime Branch and A.D.C R.K Singh aimed at raising public awareness about traffic rules. Dr. Anju Ahuja eminent Gynaecologist delivered the lecture on World Cancer Day to raise awareness of cancer and to encourage its prevention, detection, and treatment. Gurugram University pays tribute to the great freedom fighter Netaji Subhash Chandra Bose on his birthday who believed that a true soldier needs both military and spiritual training. Hon’ble Vice-Chancellor Dr Markanday Ahuja took special motivational lecture on communication skill organized by Haryana Vishwakarma Skill University. Dr. Richa Vats gave an energetic lecture on oral hygiene on dental hygiene month. Gurugram University celebrated surgical strike Day on 28th September, to commemorate the cross-border operation India had carried out against terror camps in Pakistan two years ago. Gurugram University celebrates 4th International Yoga Day on 21st June 2018 with great enthusiasm and vigour. 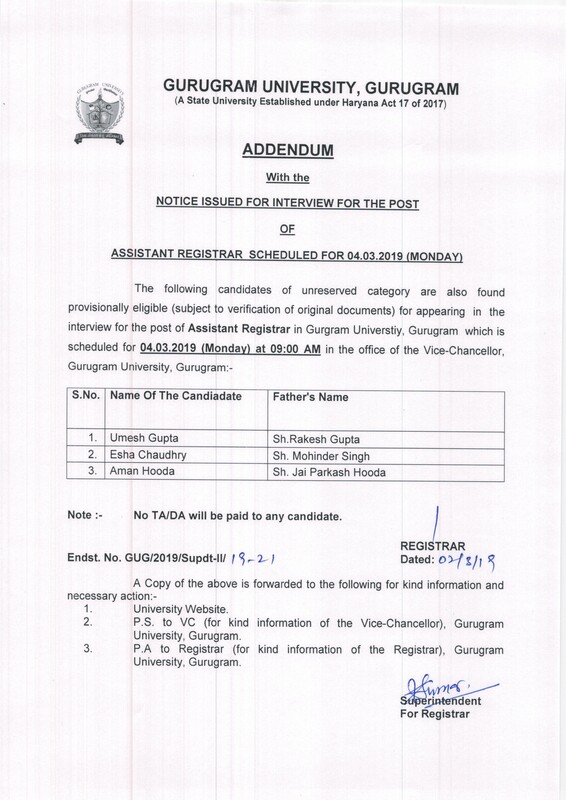 M.Com 5 years students are directed to appear for Viva on 16.01.2019 positively. 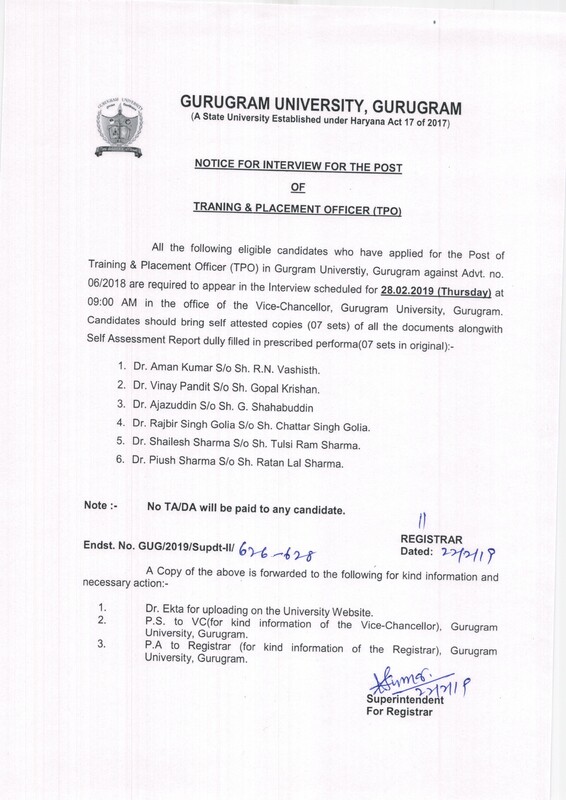 The University invites applications for Non-Teaching posts i.e. Daftri, Peon, Hostel Attendant(Male), Hostel Attendant(Female), Library Cleaner, Lab Cleaner, Library Attendant etc. 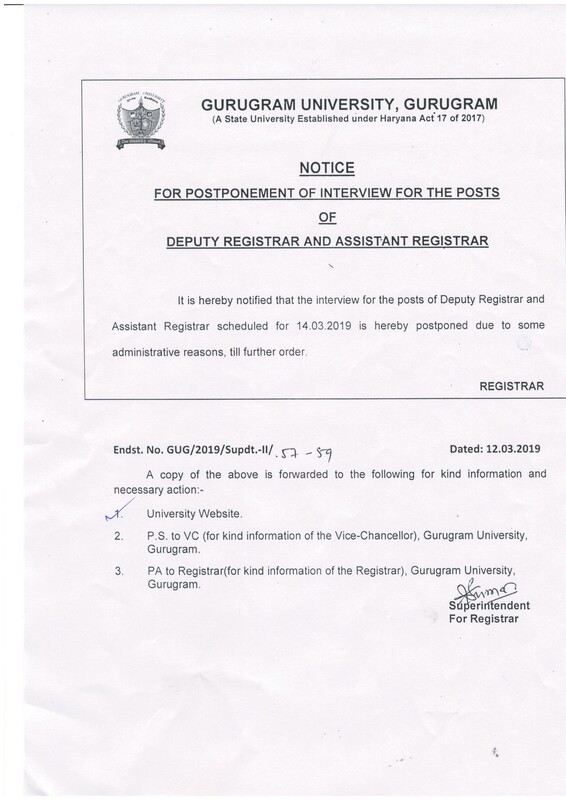 The University invites applications for the posts of Controller of Examinations, Deputy Registrar and Assistant Registrar. 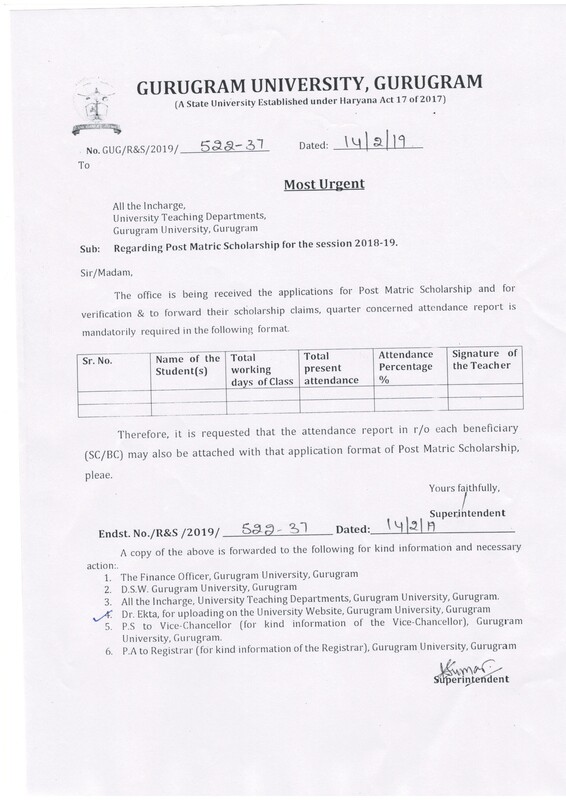 The Schedule of admissions in PG Diploma in Corporate Laws and PG Diploma in Labour Laws and Labour Management has been revised. 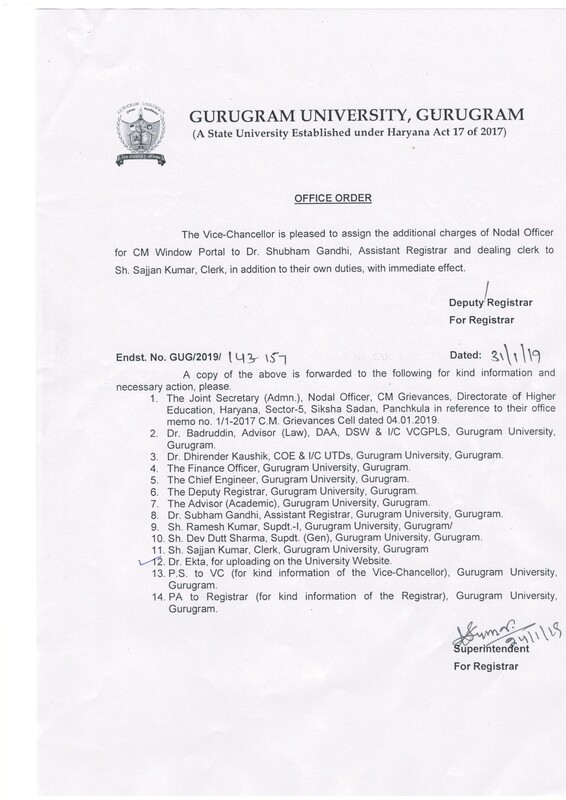 Hon?ble Vice-Chancellor of Gurugram University Dr Markanday Ahuja assumed additional charge of Indira Gandhi University Meerpur, Rewari. 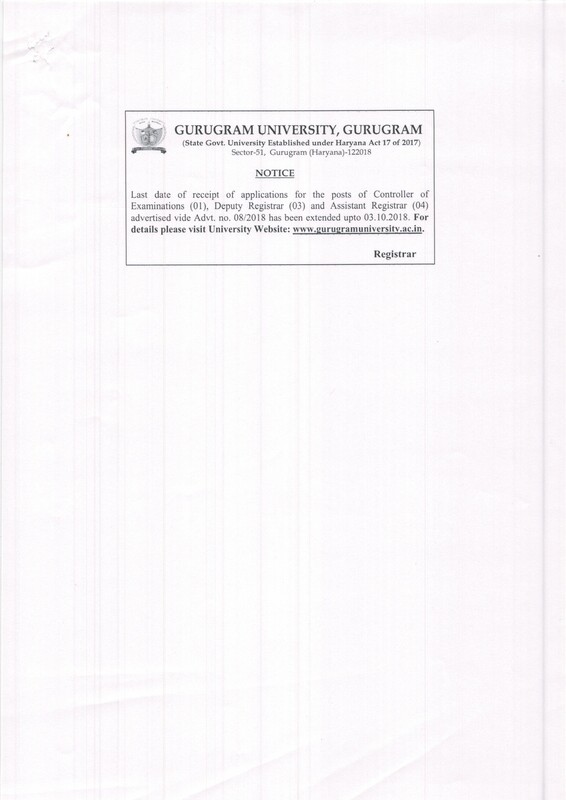 Invitation for Tenders- Construction of entrance gate & boundary wall for Gurugram University at sector-87, gurugram. Hon?ble Vice-Chancellor of Indira Gandhi University Meerpur, Rewari Dr Markanday Ahuja and Eminent Gynaecologist and Educationist Prof(Dr) Anju Ahuja took part enthusiastically and practiced various ?asanas? of Yoga and pranayama at Indira Gandhi University Meerpur, Rewari. Gurugram University will be synonymous with excellence in education. The students from every nook and corner of the country and from every group and stratum of society will live, learn and play in the sprawling lush green campus, nestled at Sector-51, Gurugram. It is great that you have taken an important step forward by choosing to embark on a future enriched with global studies at Gurugram University. The University will have faculty and other support and service staff, who will cater various needs of students and campus which will facilitate learning and imbibe the best practices among students. Moreover the University will provide world class facilities, which will be constantly reviewed and upgraded to reflect the latest trends and developments in higher education. In this story Dronacharya is commonly viewed as being cruel and self centered but Dronacharya blessed Eklavya with immortality by asking him for his thumb thereby raising his status from studentship to epitome of discipleship. So when people think of devotion, they think of Eklavya, and not Arjuna. Dronacharya took the blame on him and uplifted his student which reflects that even if Guru is wrong, if your devotion is there you can never go wrong. 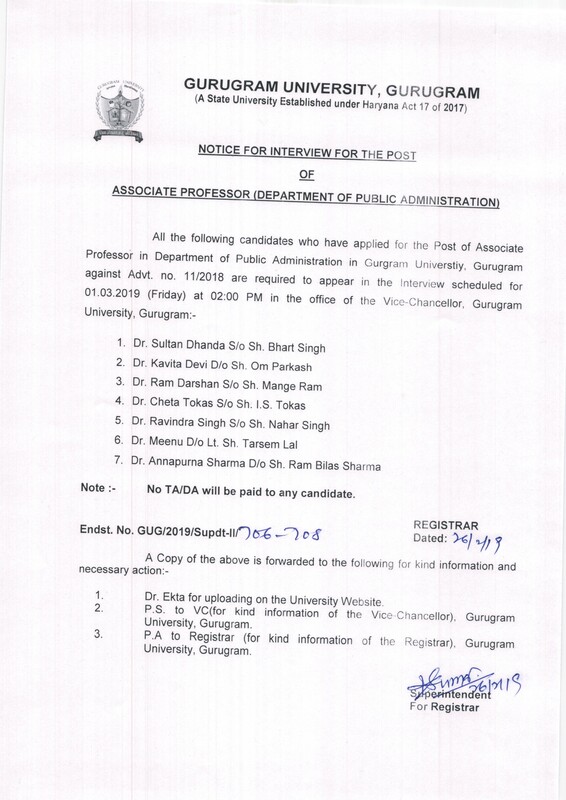 Interview notice for the Candidate applied for Post of Associate Professor in Pub. Admn. 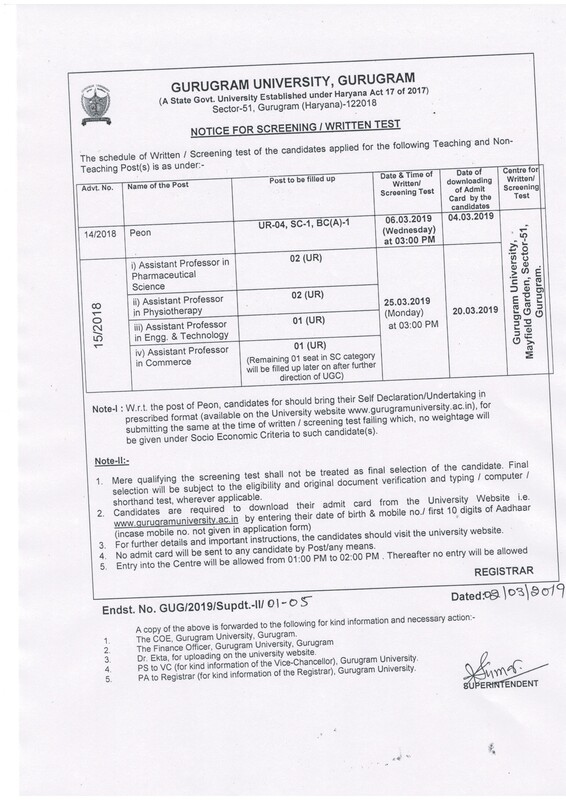 Corrigendum / Notice for exclusion of negative marking. 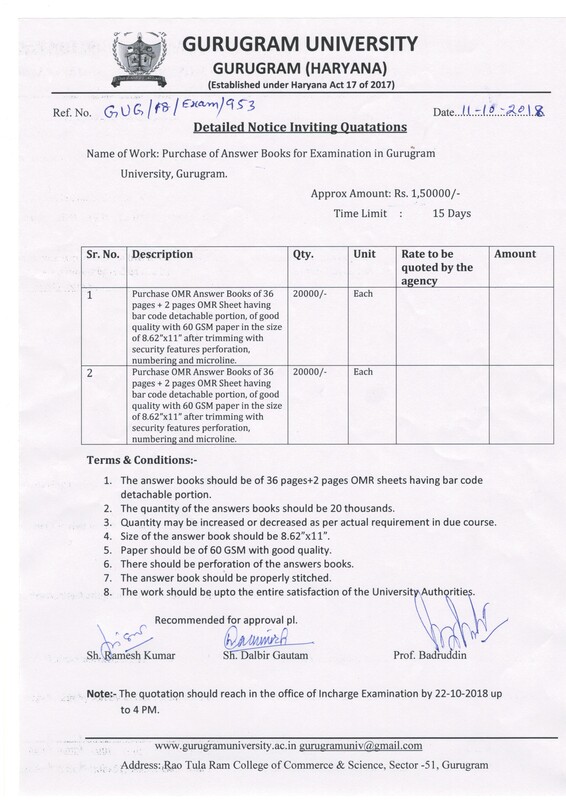 Notice for purchase of Answer Books for Examination in Gurugram. Applications are invited for the Teaching Posts. 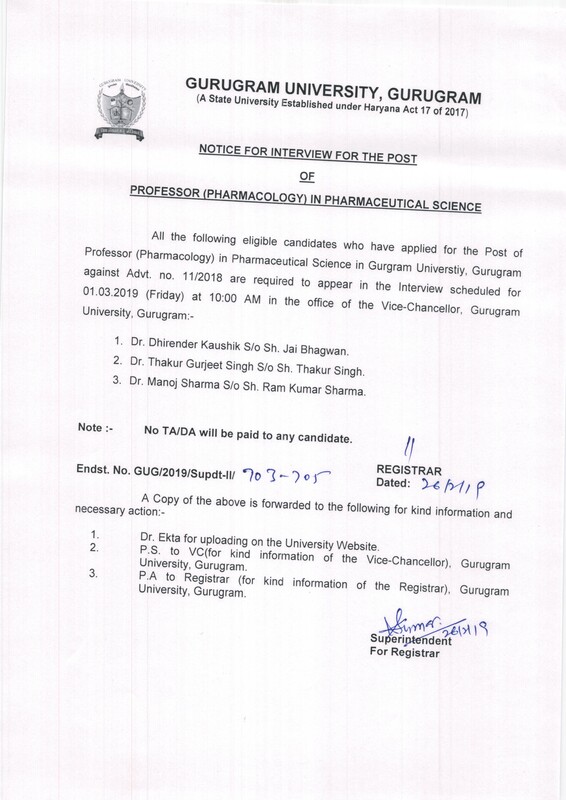 The University invites applications for the One post of Associate Professor (Pharmacology Specialization). 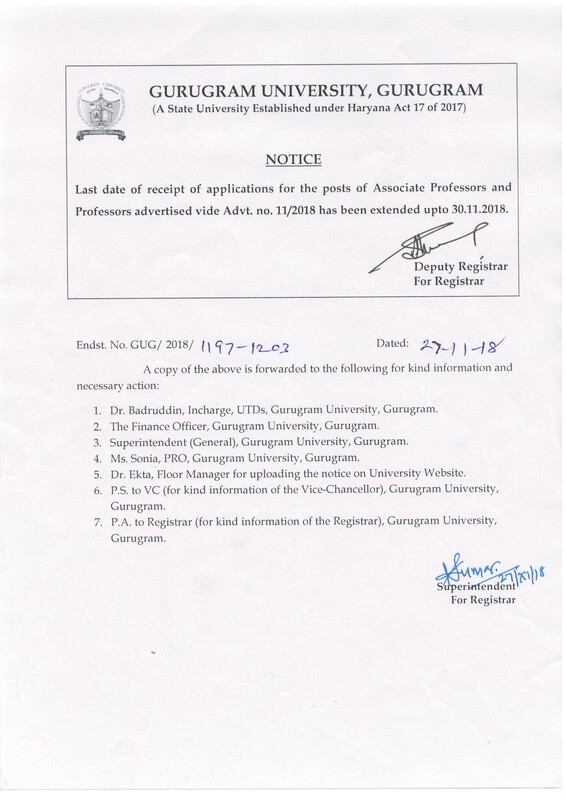 Wanted Retired Professors of Commerce, full time for Gurugram University. 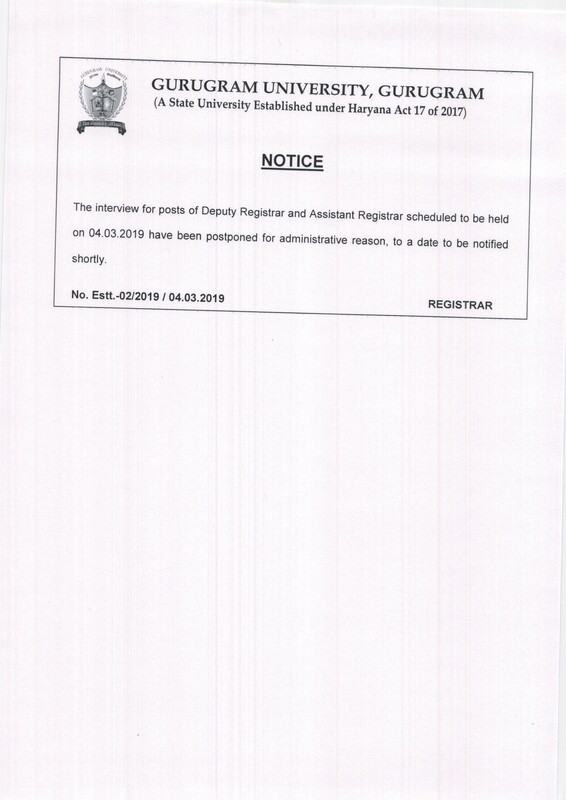 Applications are invited from suitable candidates for Contractual position of 01 (one) Deputy Registrar. 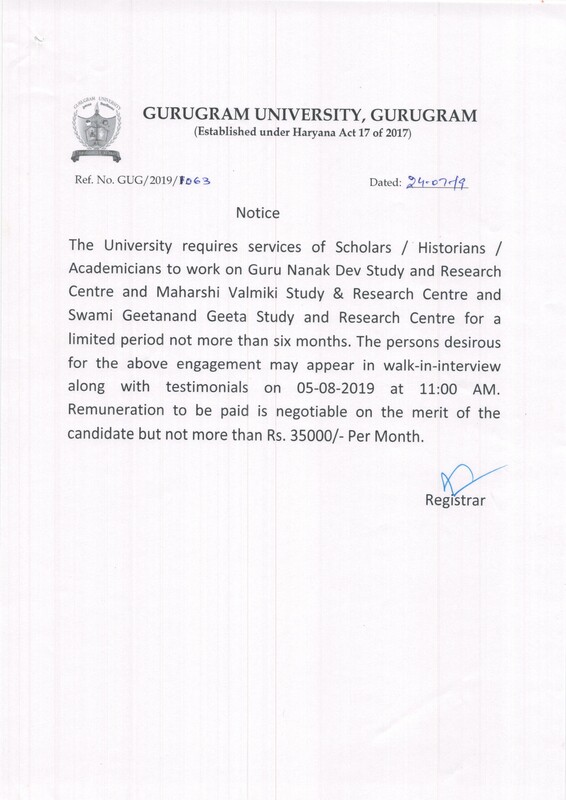 Wanted one Retired Professor of Law, full time for Gurugram University. Gurugram university organized an event on world polio day. Hon’ble gynaecologist Dr. Amodita Ahuja took a lecture on world polio day on 25 October, 2018. Run for unity program organized to celebrate National Unity Day on the occasion of the 143th anniversary of Sardar Vallabhbhai Patel at Gurugram University, Gurugram on 31 October, 2018. A Memorandum of Understanding (MoU) has been signed between Indian Institute of Corporate Affairs (IICA) and Gurugram University for entrepreneurship development on 12 November, 2018. A Memorandum of Understanding (MoU) has been signed between Shri Vishwakarma Skill University and Gurugram University for upgradation of academics and skill enhancement on 22 November, 2018. Gurugram University organized an event on the world AIDS day. Eminent gynecologist and speaker Dr Anju Ahuja took a lecture on AIDS awareness for students on 1st December 2018. Run for unity program organized to celebrate National Unity Day on the occasion of the 143th anniversary of Sardar Vallabhbhai Patel at Gurugram University, Gurugram on 31 October 2018. A Memorandum of Understanding (MoU) has been signed between Fortis Hospital, Gurugram and Gurugram University on 21st December 2018. A Memorandum of Understanding (MoU) has been signed between Medhavi College, Nepal and Gurugram University for entrepreneurship development on 18th December 2018. © 2018 Gurugram University. All Rights Reserved.